I have heard many mixes in my life but some of the tracks on this EP made me wonder what the word “mix” actually means. Obviously the concept is likewise a bit blurry to Roger That Jr. whose mixes have absolutely nothing to do with the original “D. Exiguus Was Wrong”. I’m not saying that it’s a bad thing, quite the opposite. Then again, Lime and Vhiiula went the other way and made somewhat more typical mixes which balances the EP nicely. The EP starts off with Lime’s nice and mellow track. After listening to those relaxing pads and steady beat I wondered what the hell is going on when RTJ’s “Radio Mix 1” began to play. The broken speech synth and stoned harddrive sounds just made me go nanners. The third track is also from RTJ’s obviously deviated mind and continues with the “original? what original?” line. This one isn’t plain experimental noise like the second track but more like noisy ambient with something that could perhaps be described as melody. Moving on to the fourth track was quite a shock for me as it went back to the more typical way of remixing. Vhiiula’s mix is a bit like Lime’s but only a tad. Lime’s mix is mellow and steady all the way but Vhiiula went for the original’s style mixing up a calm melody with medium fast beats. The fifth and last piece on this mixes & remixes EP is by the man himself, Ceniq. Again the lets-forget-D.-Exiguus approach is there. This “C Side” is something I didn’t expect from Ceniq because it’s quiteaggressive and without a proper melody. Strangely this one turned out to be my favourite of the five tunes. Long story short “D. 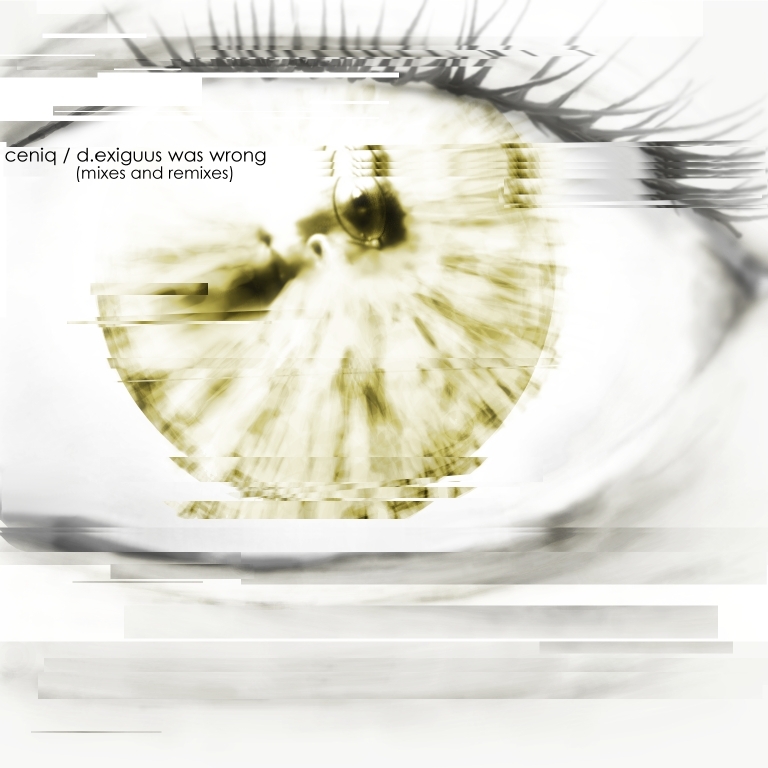 Exiguus Was Wrong (Mixes & Remixes)” is a collection of tracks that have almost nothing to do with each other except for the fact that they are music (at least some of them). In my opinion that is the reason why the EP works so well. “Brilliant” is one of the words that come to my mind at the moment. Lime/Bulentoi did the first remix of ceniq’s excellent tune. The result is a fine ambient piece with a lot of strings, and a typical relaxed everchanging beat (samples reminded me of BrothomStates). No innovation, though a nice tune. C Side brings us back to the experimental side of this EP. The beats and bassline (?) are very chaotic, but in a good way. Quality haunting noisy sound effects. Short but long enough (2:37), and a nice ending.